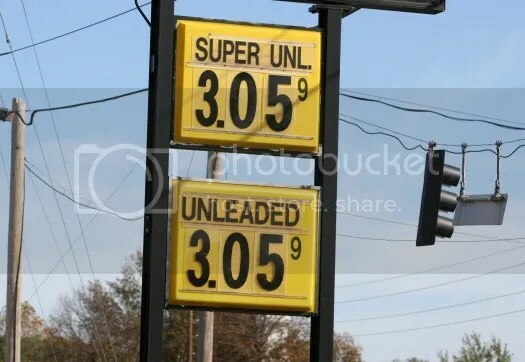 The price of gas in west central Missouri on October 31, 2012. Still, it’s been a while since we’ve heard a peep from Vicky Hartzler (r) about gas prices. I wonder why? The Committee for Advancement of Cotton. My new favorite political action committee name. Money from Evita Mooselini! A grifter working the long con. How are you gonna pay for those nasty television ads? Sanata Barabara, California? Why would an individual in California drop $50,000.00 on a down ballot statewide race in Missouri? Is Ina a relative? That $20.00 is very concerning. John Boehner! That must be in honor of Halloween. That would explain all the ads running on our tee-vee sets which aren’t available on Youtube. Evidently, freedom isn’t free, but it does get a refund. I just got called by someone, using a computer, asking me if Todd Akin can count on my support to repeal Obamacare. Akin needs better volunteers. I asked some questions. Second, I asked if Akin will vote to abolish FEMA. She didn’t know. Finally, I pointed out that Obamacare is pro-life and am offended that anyone claiming to be pro-life wants to repeal Obamacare. No response. Yep, that’s number eight out of 444 members in spending on those campaign style franked (paid for by taxpayer) mailings. ….Hartzler’s campaign declined to participate in answering the survey…. 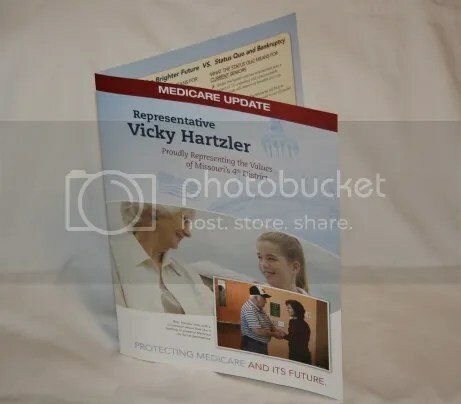 A campaign style franked mail piece from June 2012 sent by Rep. Vicky Hartzler (r). Yep, you got it. Campaign style mailers. Do people sit around a table in a smoke filled room (cough, cough, hack, hack) and say things like, “I’ll cut a check for $166,000.00 more, but I’ll be damned if I do it alone…”? just asking. That’s a total of $450,000.00 from the same folks in two days. Gee, why would republican Washington big money people bother to prop up a republican down ballot statewide candidate? Why would republican Washington big money people need to prop up a republican down ballot statewide candidate? Just asking. Announcer: People are turning to Cass County Prosecutor Teresa Hensley for Congress. The Star said, Prosecutor Hensley far outclasses Congresswoman Hartzler. The Tribune says, Hensley’s a moderate law and order type with eminent good sense. Hensley will do what’s right, protect Medicare, create jobs, put Missouri’s middle class first. Teresa Hensley (D): I’ll fight for Missouri priorities in Washington, like I have in the Prosecutor’s Office. Our seniors can count on me to protect Medicare and Social Security. I am Teresa Hensley and I approve this message. … Scholars have long recognized a distinction between firm-specific and general skills. It is quite apparent that successful CEOs leverage not only their intrinsic talents but also, and more importantly, a vast accumulation of firm-specific knowledge developed over a multi-year career. Whether it is deep knowledge of an organization’s personnel or the processes specific to a particular operation, this skill set is learned carefully over a long tenure with a company and not easily capable of quick replication at other firms. In fact, when “superstar” executives change companies, the result is usually disappointing. Horrigan was interested in the issue of CEO compensation, particularly as it involves Robert R. Archibald, the embattled director of the Missouri Historical Museum. It strikes me, though, that the point is just as apt when applied to businessmen who claim that their business success will allow them to shine as government leaders. My thoughts went immediately to two GOP candidates for high elective office who want us to believe that they are qualified for those positions because of their past business careers: Missouri gubernatorial candidate Dave Spence, and ex-financial mogul and current presidential candidate, Mitt Romney. However, the Elson and Ferrere study suggests that there is nothing in the background of a successful financier and a plastics manufacturer that would necessarily translate to success in government. It’s important to know whether a president has worked in business. It’s important because having worked in business is associated with being a lousy president, at least in the modern era. Recollect that while Mitt Romney was successful in the highly specialized financial realm, he was also by many measures a failure as governor of Massachusetts. The performance of the Massachusetts economy under Romney wasn’t that great to say the least – there’s a reason few in the state support his presidential bid. Although Romney has tried to claim that the fault lay with the Democratic legislature, the current Democratic governor, Patrick Duval together with a largely Democratic legislature has been able to rescue the state from the Bush recession twice as fact as other states. Massachusetts currently ranks in the top 10 states in job growth. So much for Romney’s vaunted claims to understand what makes an economy successful. Nor, by the measures that Elson and Ferrere suggest, should we assume that Mr. Spence’s success in a very specialized plastics business would translate into the skill set that would allow him to take the reins of a complex state government. As for his more generalized management skills, we have only to examine his to-date feckless, largely self-financed campaign, to get an idea of his ability to run entities that are not organized around a specific body of manufacturing knowledge. None of this is surprising, of course. Think of successful businessman and colossally failed president Herbert Hoover. Or, to take a more recent example, think back to the hilarious spectacle of real estate tycoon Donald Trump contemplating a run for President and it’s easy to conclude that instead of a savy manager, successful businessmen transplanted to government are apt to prove either inept as in Hoover’s case, or total clowns, as would surely be the case were Trump to ever win office.